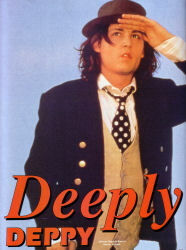 In Benny & Joon, Johnny Depp goes off the deep-end. David Aldridge finds out why. Johnny Depp doesn’t do mornings, I’ve been told. As an inveterate nightbird, rumor had it he was rarely up and around for them. So I’m both a little surprised and mildly apprehensive to find myself allocated an 11 a.m. chat slot with filmdom’s favorite “oddball.” But I needn’t have worried. Barely ten minutes after the appointed time, a pretty hep Depp strolls into his London hotel room, shucks off his lived-in leather jacket, brushes the shoulder-length brown hair back off his face—and politely asks me if I mind him lighting his lungs up. I don’t. So the teen-dream star of Cry-Baby, Edward Scissorhands and the new borderline-reality romance Benny & Joon, out on July 9th, fires up the first in a chain of cowboy-country cigarettes—and amiably and openly submits to an interview which wide-ranges from his relationship with Winona Ryder to his late grandmother’s toenails! But before we get deeply Deppy, I ask Johnny whether he actively seeks out the left-of-center roles that he seems to have cornered the market in—or whether that’s just the way the kookiness crumbles. Johnny takes time over the reply, and chooses his words with care. It doesn’t take much pushing to get Johnny to admit that maybe he’s drawn to filmdom’s freaks and oddballs, to characters whose interiors and exteriors maybe don’t quite match, because he’s more than a little like that himself. And, indeed, this backwoods-born former musician does sometimes seem as off-the-wall for real as he invariably is for reel. For instance, there’s his instant response when I ask him for his earliest childhood memory. However, one suspects that Johnny won’t ever stray too far workwise from the not-so-straight and narrow. For he cites as his “dream role,” the one he’d really like to play, that of the hapless hero of Kafka’s classic Metamorphosis—the creepy-crawly tale of a man who inexplicably mutates overnight into a giant waterbug! 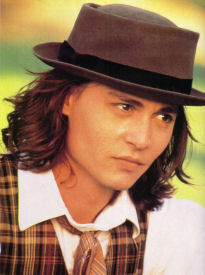 When we meet, Johnny is mid-way through a three-day trip to London to promote his new movie Benny & Joon. In this brink-of-reality romance, Mary Stuart Masterson is Joon, a pretty schizophrenic, and Aidan Quinn is Benny, her overprotective elder brother. Into their sheltered world comes Johnny’s Sam, a simple wonderment-maker who mentally dances to a different drummer from almost everybody else. Joon can follow his beat, but Benny isn’t sure she should. In the film, Sam is a Keaton and Chaplin freak who can uncannily recreate his heroes’ slapstick antics. Off screen, Johnny thinks silents are golden, too. In particular, he’s keen as Buster on Keaton. 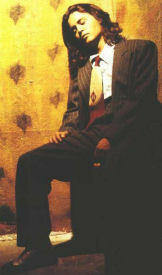 A professional mime helped Johnny fine-tune his innate Keaton-esque and Chaplin-esque “silent” skills for Benny & Joon. Some of the slapstick is new stuff, merely “inspired” by his mentors. But, in one or two scenes, Johnny perfectly apes them—as when he does Chaplin’s famous dancing-breadrolls sequence. Interestingly, Robert Downey Jr. recreated the very same sequence for Charlie biopic Chaplin—a film that Johnny was reportedly shortlisted for. At this juncture, a Depp-arture from the narrative for a brief bit of biog. Born in Kentucky, bluegrasser Johnny actually grew up in Miramar, Florida, where music was his first love. Forming a rock band called Kids, he enjoyed considerable regional success before a move to LA, and a bid to break into the bigtime. But the band quickly folded, and Johnny turned to acting on the advice of a friend. A Nightmare on Elm Street furnished him with his first major acting job, and he subsequently appeared in movies as diverse as the little-known Slow Burn and the Oscar-winning Platoon. However, his real breakthrough came courtesy of TV—when he landed the role of detective Tom Hanson in the hit series 21 Jump Street. He starred for four seasons before seamlessly segueing into the lead roles of such big-screen hits as John Waters’ Cry-Baby and Tim Burton’s Edward Scissorhands. Johnny’s dark-and-dreamy good looks have made him a teen-mag fave, with a fan following to match. And, though he’s essentially a shy, private kind of guy, he tolerates the adulation that goes with the territory. “I can’t say that I go down to the mall as much as I used to as a kid,” he quips, when we discuss street recognition. “And it’s not something I’ll ever be really comfortable with. “But, equally, were it all to suddenly stop, I’d probably really start worrying. It does get a bit weird, of course—being under the microscope and on display all the time. And I can’t really understand why there should be all this interest in the private life of someone who basically just sells lies for money. An actor is just an actor, after all. Johnny won’t be drawn as to whether anyone has yet replaced Winona in his affections, but he hates being lonesome, he says. So, by inference, if he hasn’t already found someone, he won’t be long a-looking. But Johnny doesn’t just worry about being lonely. Possessed of a typical actor’s insecurity, he admits to worrying about lots of things. 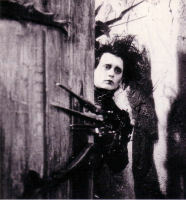 And he says his fellow actors are often sources of great solace, citing Edward Scissorhands as a special instance. “It was a tough time for me,” he recalls. “I was feeling really vulnerable—kind of insecure. Vincent Price was wonderful—he gave me great advice. And Alan Arkin and Dianne Wiest were real supportive, too. Our talk butterfly-hops from topic to topic. Johnny’s greatest fear? “Bees,” he says. “Yeah, I’ve been stung, and it really, really hurt. I got stung on the ear by a whole herd, a whole gaggle of them when I was a kid. And what makes the Cry-Baby cry? “Oh, lots of things,” he says. “I cry when I’m hurt. Sometimes I find myself crying when I’m in a restaurant, and I see, say, an elderly woman eating. Like Sam, his Benny & Joon character, Johnny patently marches to a different drummer than most of us. But we can follow the beat of this odd but likeable “otherworlder.” And that’s made him one of moviedom’s most-in-demand actors, with a packed work programme. Already in the can, there’s Emir Kusturica’s Arizona Dream, in which he costars with Faye Dunaway and Jerry Lewis, and Lasse Hallstrom’s What’s Eating Gilbert Grape, in which he’s partnered with fellow up-and-comer Juliette Lewis. Renewing his friendship with Tim Burton, he’s currently making Ed Wood, the biopic of Hollywood’s best-known and most-cultish B-movie maker. In true Ed Wood-ian tradition, the movie is being made in black-and-white. Depp also says he’s “attached” to a number of other projects, most notable of which, to his reckoning, is something called It Only Rains at Night, to be directed by Neal Jimenez, maker of acclaimed movie The Waterdance. Oh, and along with Metamorphosis, mentioned earlier, he’d love, he says, to also make a movie version of classic literary heavy Crime and Punishment.